Prefects uphold the school code of conduct and are polite. They carry out regular duties and attend meetings when required. 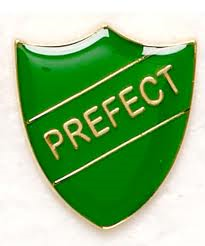 Prefects are identified by wearing a prefect badge and a striped tie with school logo. St. Crispin’s Senior Prefects are appointed after a full application process, including formal interviews. 20 of our finest Sixth Form pupils are selected for the team each year. The Head Boy and Girl is subsequently selected from the senior prefect team whereby they go through further interviews and individual speeches. They are then voted in by the Sixth Form student body. Once the selection process is complete, the Senior Prefects then carry out their duties under the leadership of the Head Boy and Head Girl. Prefects are encouraged to take part in developing leadership and presentational skills, debate and public speaking. Each member of the Head Team, including Deputy Head Boy and Girl heads up a sub-committee of the School Council and School Houses, helping to shape school policies and rules alongside giving their input into school-wide strategies. Our prefects are the best role models and we are extraordinarily proud of them.